Home → Blog → LAUNCH OF MY THAMES BOOK!! 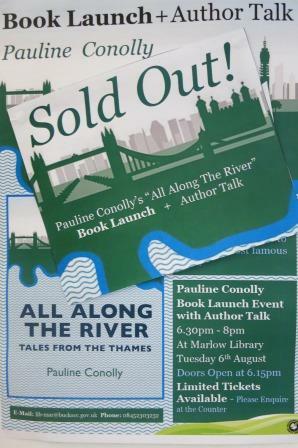 ALL ALONG THE RIVER: TALES FROM THE THAMES was released on July 31 by London publisher Robert Hale. Rob and I celebrated with lunch at the Show Boat, moored by the river at the Harleyford estate just outside Marlow. It was owning a lodge in this glorious location that prompted us to walk the Thames Path from source to sea. And of course ultimately it led to the writing of the book. After our meal (how creative chefs Karl and Manu are!) the charming Maitre D Captain Igor took our photo. It was a special day, and good to relax between flying in from Australia and the official book launch on August 6. Choosing a venue for a book launch is a tricky business. For example, how many people are likely to turn up? You don’t want 30 people looking lost in a barn of a building! 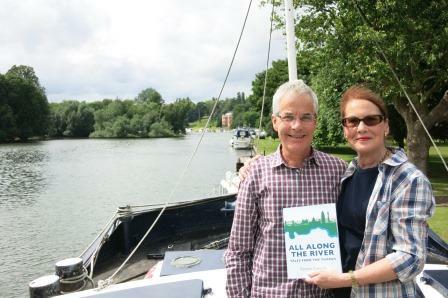 Rob and I knew middle Thames Marlow was the right location for the launch but where in Marlow? We considered the golf club at Harleyford (bit out-of-the-way?) The famous Complete Angler (bit expensive?) Court Garden (bit big?) then someone mentioned the local library. I had been a member here for years and when we approached Library Manager Harlene Semmens she was so positive and helpful that we knew immediately it was the right choice. The library offered to supply wine, soft drinks and nibbles, print posters and tickets, advertise the launch online etc etc. This was very generous as it was to be a free event. They were also flexible re numbers. The library is not large, but Harlene was confident they could cope with around 50. 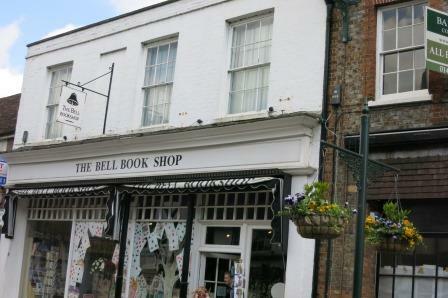 She suggested The Bell Bookshop from neighbouring Henley as host book seller for the event and they were happy to come on board. Our dear Marlow friend John Pritchard took on the launch as a project and was amazing in getting the word out re his many contacts! As we were back in Oz at this stage it was such a help!! 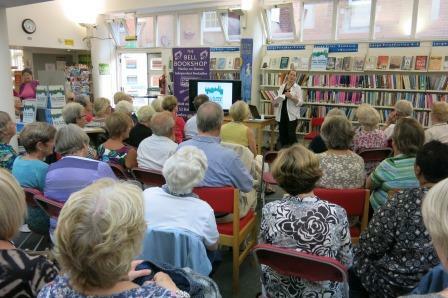 He even arranged for Mayor of Marlow, Suzanne Brown to come along and give an introductory talk..
By the time we arrived back in the UK Harlene had stretched capacity to 60+ but all the tickets had gone. Now here’s a sight to lift the heart of an author. Balm to an author’s heart! The event was a truly memorable experience for me and equally for Rob. He contributed so much to the book with his photography and….. well, too much else to mention. Appropriately, it is dedicated to him (my darling Dr Bob). So many friends came from Marlow and Maidenhead, London and beyond. Thanks to the miracle of the Internet, even members of my late mother’s family were there (how special that was!) Our old friend Bill Wilson who joined us on the original walk from Richmond to the Flood Barrier came from the far west of Wales with his lovely partner Caroline. Just too many special people to name here but you all know how much I appreciate your friendship. Yes, Her Worshipfulness Suzanne Brown (you shouldn’t have mentioned that title to me Suzanne, it’s irresistible!) deserves her own headline. What a wonderful personality and what a great introduction she gave; so apt , so witty, so generous. She’s a star and a great asset for Marlow. 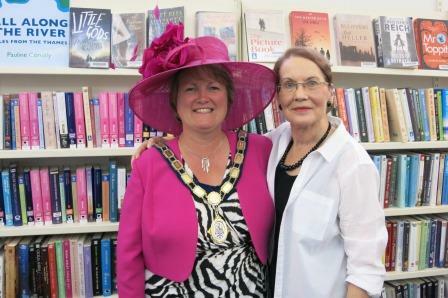 Mayor Suzanne Brown and a very impressed author! Suzanne explained that she needs so many hats for all her engagements that she buys them from charity shops. Isn’t that brilliant? Of course they have particularly high quality stock in Marlow! This prompted our high flying writer friend Errol to tell the Mayor that he was wearing a shirt his young son bought him from a charity shop for two quid. Looked wonderful on him I must say. And I’m sure you will agree that Suzanne’s pink hat looks fantastic on her! I might wear one to my next launch, though my shirt would have to be upgraded to something more classy. Would also be hard to find a necklace to rival that mayoral chain of office! Then it was my turn with the PowerPoint presentation. Oh dear, will I ever get used to this? The Q&A session is always less stressful and thankfully plenty of hands went up. Was slightly worried that someone from (D)Reading might be in the audience but if so they were too polite to heckle me or ask awkward questions. I have a secret affection for Reading really, and didn’t mean any harm by comments in the book, honestly. Time for the book signing, not that easy for a left-handed person, but such a pleasurable part of being an author after all the angst of publication. Must say I look extremely precarious perched on the edge of that chair. Thanks to my cousin Bonnie for this shot, taken on her broken phone (there’s another story!) 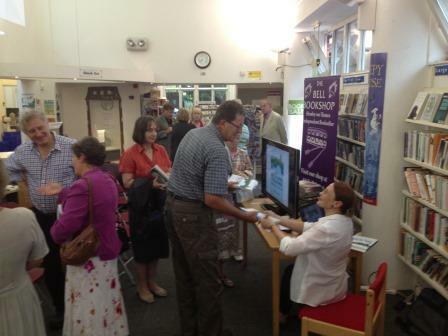 Rob was busy with Alison rustling up extra copies as supplies ran out. Once again my sincere thanks to everyone involved in the launch… John, Harlene and her staff, Alison from the Bell Bookshop, Mayor Suzanne, and Rob. And thanks to everyone who shared the experience with us. My apologies to those who missed out on attending, but there are signed copies of the book available from the bookshop in Henley. It is also in stock at the iconic Blackwells in Oxford. All comments more than welcome. But remember dear Reading residents, I have the power to censor!! The Mysterious Case of the Queen's Oak at Hurley Lock! Congratulations on your book launch, dear Pauline! I think you look rather smart up there with your powerpoint presentation! Already a pro! Oh no.. time for maths again, and it is past my bedtime!